The Mono is a simple one-strut Allrounder with a focus on performance and handling. 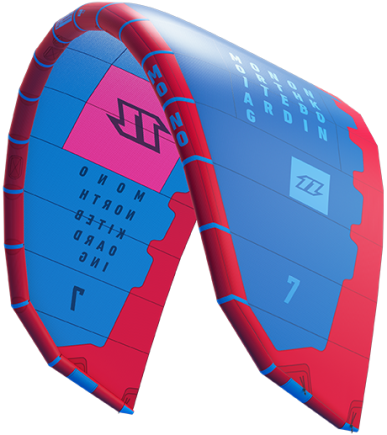 It is perfect for traveling and can perform on a twin tip, directional or foil board. 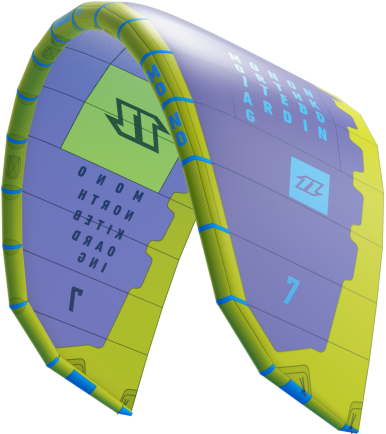 The smaller sizes are ideal for fast progression, freeriders, wave riders and foil boarders alike. The kite has amazing low-end performance, and it flies upwind with ease. The relaunch is very fast and easy; thanks to the Delta design the kite doesn’t stick to the water. The bar pressure is light, while there is a progressive power development as you sheet in, making it very easy to ride. Handling of the Mono is very dynamic, with fast, reactive steering the kite works well in all situations, also on foil boards. While the weight of the kite has been kept to a minimum, there are plenty of reinforcements in the right places to ensure it is very robust too. If you want a great all-rounder with an incredible low-end for easy freeriding duties, the Mono is it! The new North Mono is my hydrofoil choice in very light winds (above 6 knots) Below that you really need a foil kite. I use the Mono on 27m lines for the better low-end performance. Why a tube above a foil kite in these kind of conditions? Well, just one reason. Playfullness! I like to throw a kite around and play with the different kite positions. The Mono has a great low-end, great stability and is very user friendly. Crash the kite in 6 knots conditions, just have patience :) play a bit with your lines to prevent water on your canopy and the center strut will catch some wind!